Everything is a superfood in this easy dish! Tahini, a mighty superfood, adds a touch of healthy fat and protein. Great served as a side dish or a veggie appetizer platter. Wash and prep veggies as instructed. Pour olive oil in small bowl. Spread veggies out on 2 sheet pans and brush both sides with olive oil. In batches, first grill portobello caps, carrots and red onion, as these take the longest, about 5-6 minutes on each side. Remove from grill once nicely charred and place back on the sheet pan to rest. Next, grill red pepper, zucchini and yellow squash, about 3-4 minutes on each side. Finally, grill asparagus, about 2 minutes on each side. Slice the portobello caps into ¼-inch slices. Slice the red onion into 1-inch pieces. Arrange all vegetables using your brilliant creativity. Drizzle with tahini and squeeze fresh lemon over all. Salt and pepper to taste. Serve warm or at room temperature. 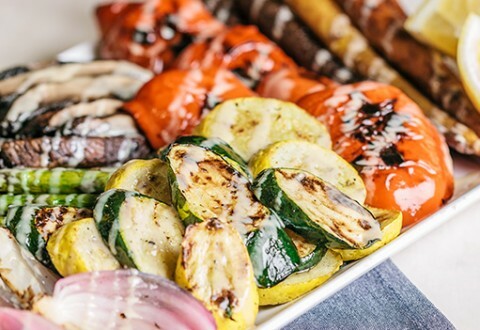 To get nice grill marks, do not move the vegetables while they grill. Let them rest in one spot and check 1-2 sample pieces in different places on the grill to gauge doneness before turning.